The Monatsschlössl is a Baroque chateaux in the extensive parks of the leisure palace Schloss Hellbrunn. 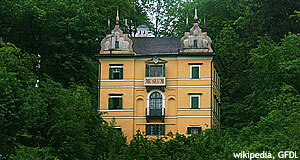 The Monatsschlössl houses the Volkskundemuseum since 1924, a museum of local ethnology and folk culture. Originally, the building served as a hunting base to Prince Archbishop Markus Sittikus (1612 to 1619). It was built in 1615. The name Monatsschlössl translates as "one month palace"; according to legend, this is because the chateaux was built within a single month. We are not sure whether this is true, but definitely know that the renovation of 2008 took much longer. At least the Monatsschlössl looks very nice now. The building can be found on an exposed spot on a forested cliff; the view on Salzburg along justifies a visit. In the Volkskundemuseum, you will find examples for traditions and customs in Salzburg; an array of traditional costumes (dirndl dresses for women, lederhosen and special coats for men) from different regions within the Salzburg province. Rustic paintings and elaborately decorated furniture allow to follow the development of rural interior designs from the Baroque age to more recent times. There are a few items related to traditional medical treatments and religious artefacts. The latter ones include Baroque nativity scenes, religious paintings and ceremonial items. For foreigners, the most peculiar sight of the Volkskundemuseum and Monatsschlössl must be the Samson-figures and the Perchten masks. The former are used for a peculiar custom in the Lungau region, where a giant figure accompanied by dwarves is carried around in a procession. The Perchten and Glöckler are traditions with pagan origins that are still commonly practiced all over the Salzburg province, generally in December and January. The Volkskundemuseum is a side-branch of the Salzburg Museum. It is open from April to October. Note that the Salzburg Zoo, the Felsentheater (rock theatre) and the Schloss Hellbrunn Palace are within walking distance to the Monatsschlössl. Combined tickets for zoo, trick fountains, the Hellbrunn palace and the Monatsschlössl/Volkskundemuseum are available. During the summer, special exhibitions supplement the constant ones. There is an open-air museum dealing with local customs and regional cultural heritage of Salzburg in the community of Großgmain, which is bigger and probably more attractive than the Volkskundemuseum; however, if you don′t want to take the effort of driving to Großgmain, the Monatsschlössl is definitely a good place to make yourself familiar with the ethnologic aspects of life in Salzburg!